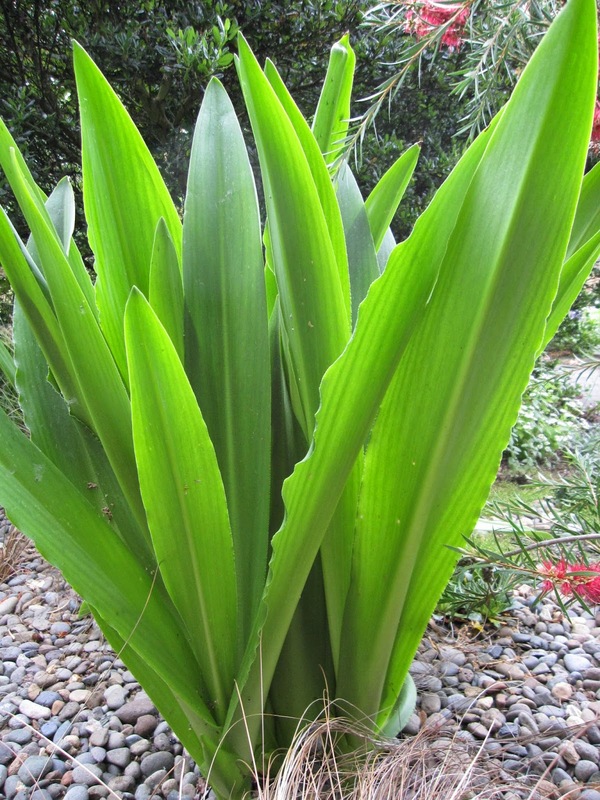 Although a few of my big leaves are evergreen, in summer, I love all my big-leafed plants even more. I just want a jungle of them around me when it's hot. Here's Trachycarpus fortunei. I like the ones I have to look up to, like Fatsia japonica. My developing Tetrapanax nursery of leaves. Upright big leaves are great, too. Here's Zantedeschia 'Flame'. And Eucomus comosa 'Sparkling Burgundy'. 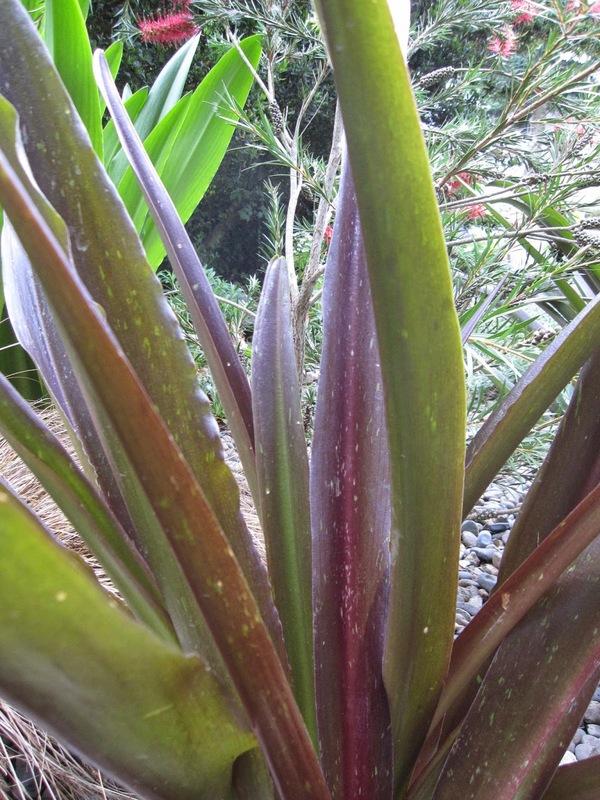 The leaves of Eucomus pallidiflora ssp pole-evansii will get even bigger as summer rolls on. Even Cyperus involucratus 'Baby Tut' won't be outdone. Some of the Syneilesis hybrid leaves are over 16 inches across this year. 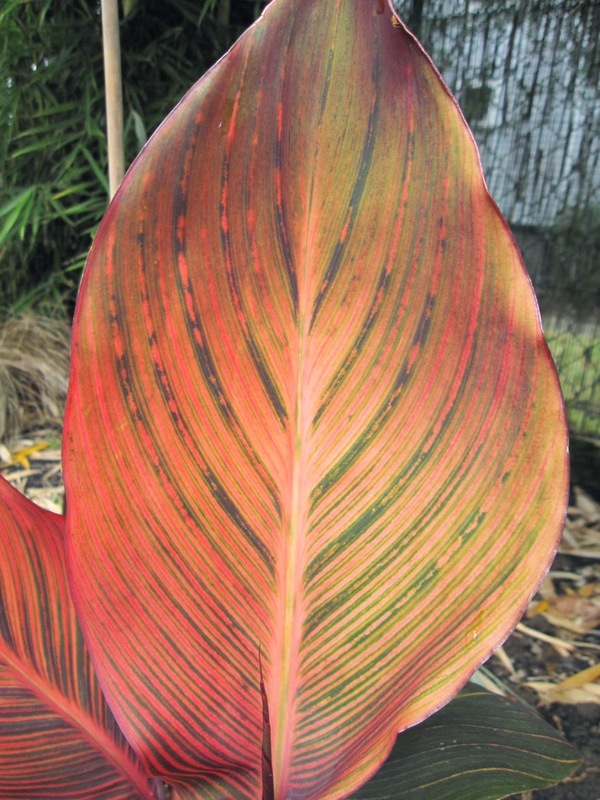 A recent addition to the big-leaf collection, two Canna 'Tropicanna'. Their foliage color is perfect in my garden. The Acanthus both have sizable leaves. Here is A. spinosa, and below it, A. mollis. Even some of the NOID hostas get into the act. There's some big foliage I covet that I'll have to leave to those with more room - Gunnera manicata and Magnolia macrophylla come to mind. 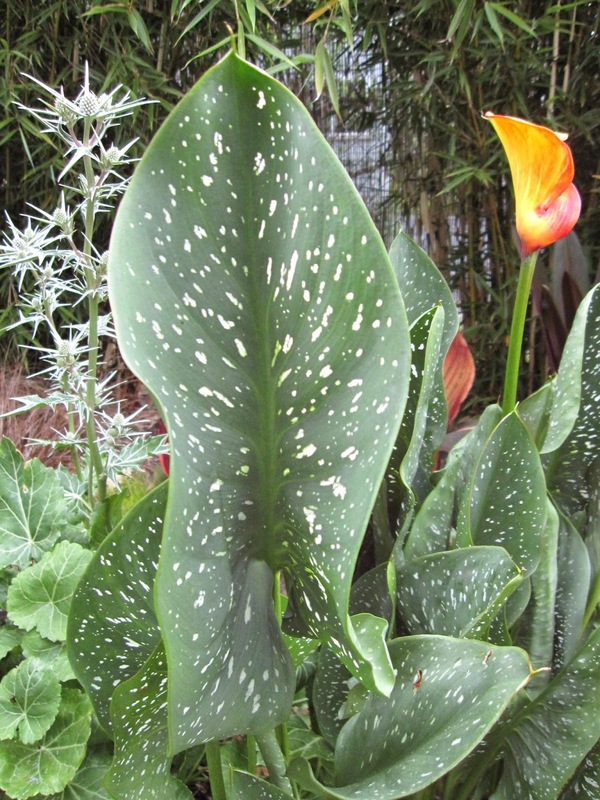 But love the leafy big boys I have the room for, especially when they strut their stuff in summer. May the big leaves of summer grow even bigger! 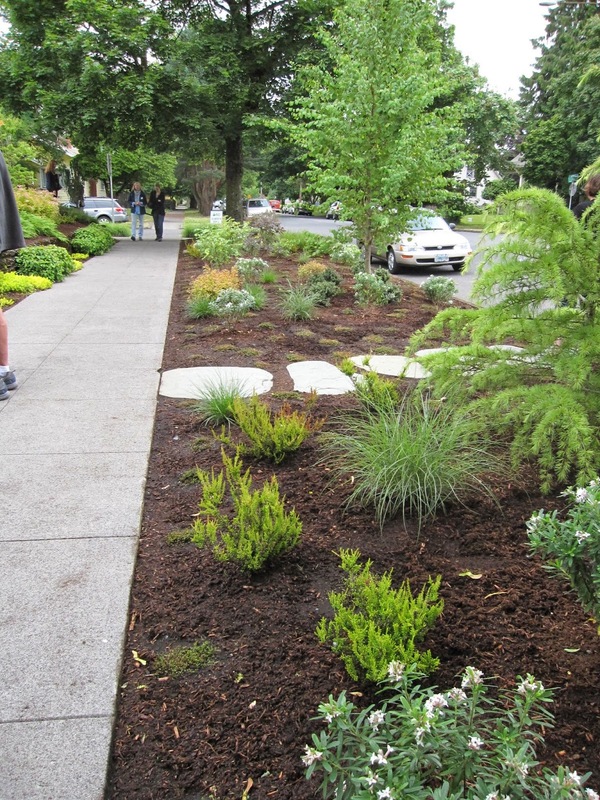 This past Wednesday, I joined a group of garden designers, bloggers and garden writers for a preview tour of the Association of Northwest Landscape Designers (ANLD) Tour to be held Saturday, June 28, 2014. There's a lot of garden tour competition this coming Saturday, and you'll be pulled in multiple directions trying to decide on tours that include the HPSO/Garden Conservancy Open Garden Day Tour, and the Sustainable Overlook Garden Tour (where I will be volunteering), just to note two others. But if your tastes run to creatively thought-out, beautifully integrated and planted city lots designed for outdoor living, you won't go wrong with the ANLD tour. The skill shown by the garden designers is manifest in their design and selection of hardscapes, structures, movement through the spaces, garden art and of course, plantings, all uniquely tuned to the needs and desires of the families living in those gardens. The next few photos are of the David P. Best garden, a melding of a contemporary Japanese garden with an industrial edge, and the owners' desire to incorporate a wide variety of specimens. Of course, this tour is a natural if you've been thinking about hiring a professional to help you increase your satisfaction with your outdoor spaces, or to help you plan changes in your landscape. It was a challenge on this pre-tour to get enough room to take representative pictures of the gardens - it was well attended and we all were at each garden together. Your appreciation of the gardens will be enhanced by the smaller crowds at each of the gardens, since your tour will be self-paced and the gardens can be seen in any order. 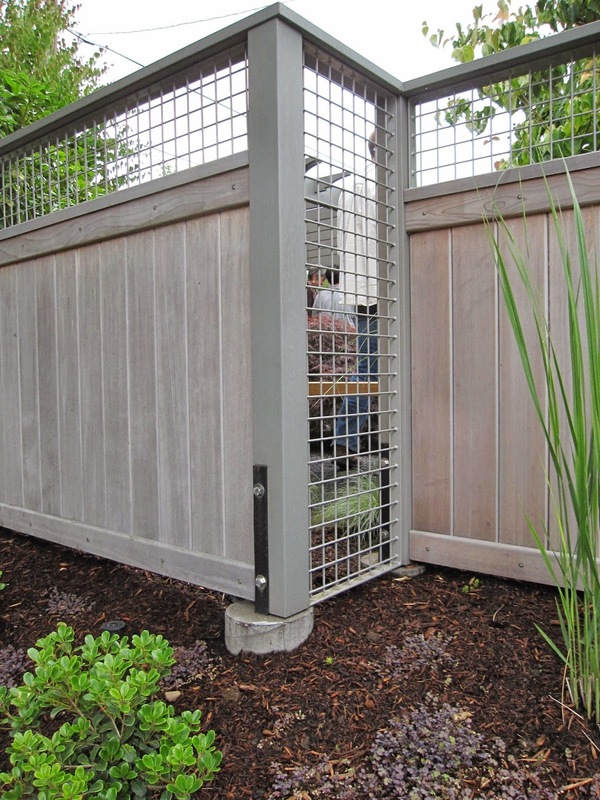 This detail in the Best Garden was deceptively simple-looking and perfectly finished to allow in light and air, while stepping back the fence to accommodate steps to the right. Several of the gardens displayed their plans for another glimpse at the design process. I found them fascinating. 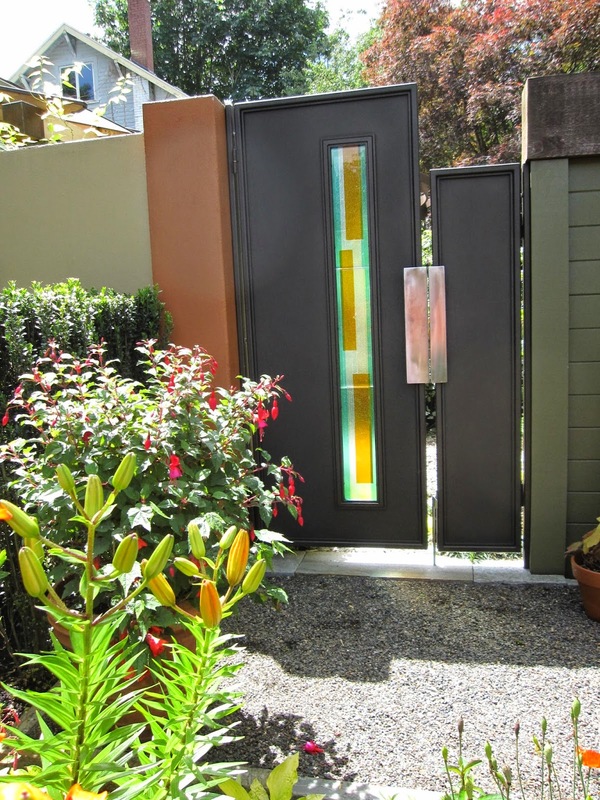 The Malone Garden surrounded a new home in an old neighborhood, and had wonderful metalwork gates and art by Mike Suri. This fanciful south gate design echoes the poppies above. A succulent roof on the garden shed enjoyed a borrowed view of cedars. The sedum tiles for the ecoroof were ordered planted, mature, and ready to install. 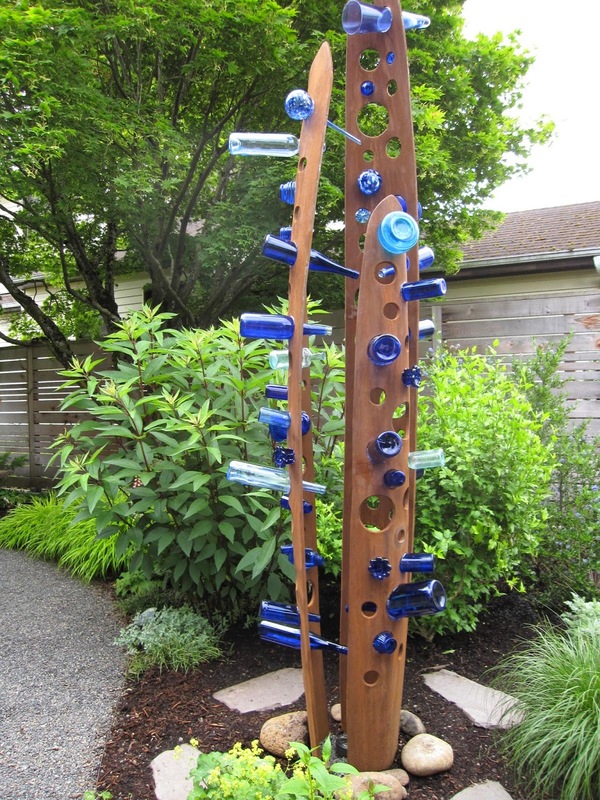 Mike Suri's take on the traditional bottle tree. Homeowner Virginia Malone described herself as "a naturalist vegetable gardener," in explaining the riot of vegetables and edibles in her raised beds. The plant mix was interesting, with heathers, manzanitas and an agave jostling each other in this front garden bed. I loved this use of a few, special rocks next to a gravel path. The Ernst/Dermer garden is one that will be on the Portland Garden Bloggers Fling tour as well. Linda Ernst is a glass artist and this fountain was designed to showcase a piece of her glass. Multiple seating areas throughout the property promote easy conversation, surrounded by plant groupings unique to each spot. A gate into the next-door Fuller garden illustrates the comfortable connection between these gardening neighbors. The steep front garden was in significant shade, but punctuated by this gorgeous color combination. 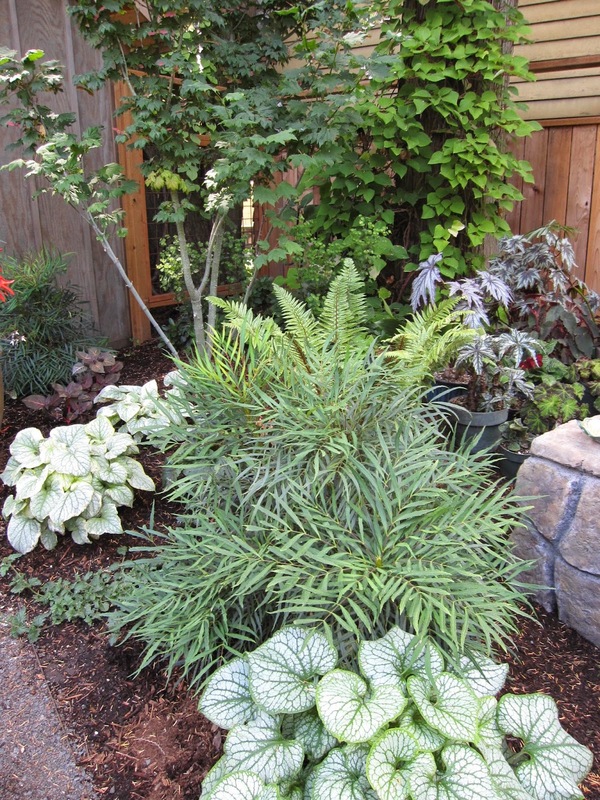 The Moore Garden used strong foliage contrasts to enhance a smaller, partially shady back garden. 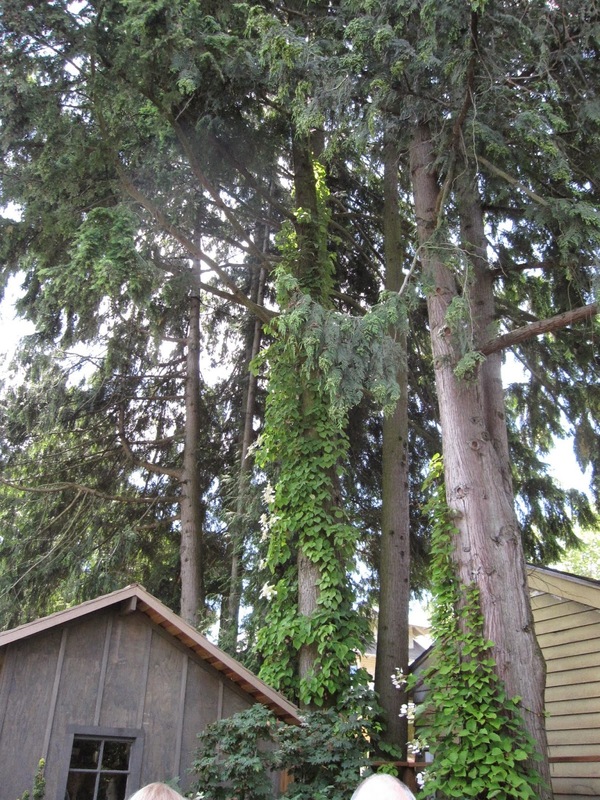 Dealing with a stand of mature conifers above the southwest corner of the lot was a challenge that the garden designer solved by locating a garden shed there. Walls created seating and pot display space in this intimate garden. Mahonia 'Soft Caress' played a strong role in the plantings, and enhanced the owner's collection of Eucomis and other semi-hardy plants. 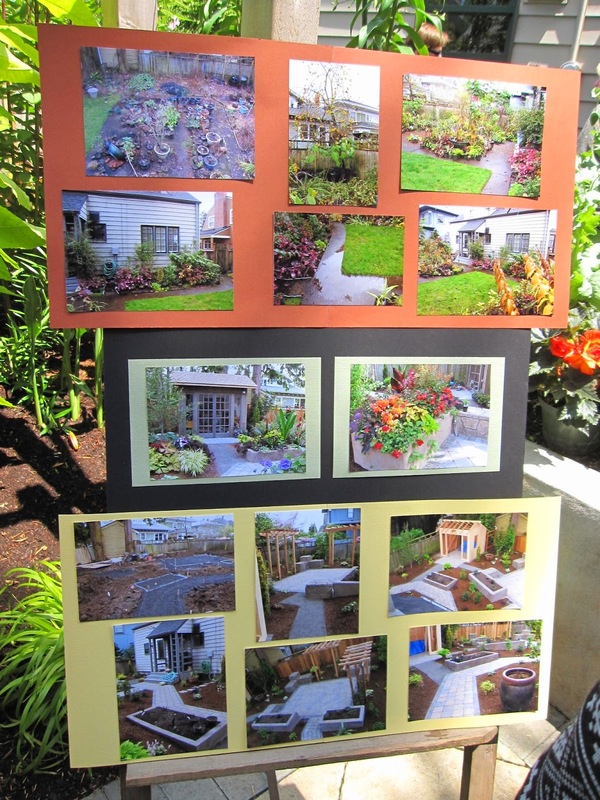 A photo board told the transformational before-during-and-after story of this very personal garden, while a garden plan showed the overall design. 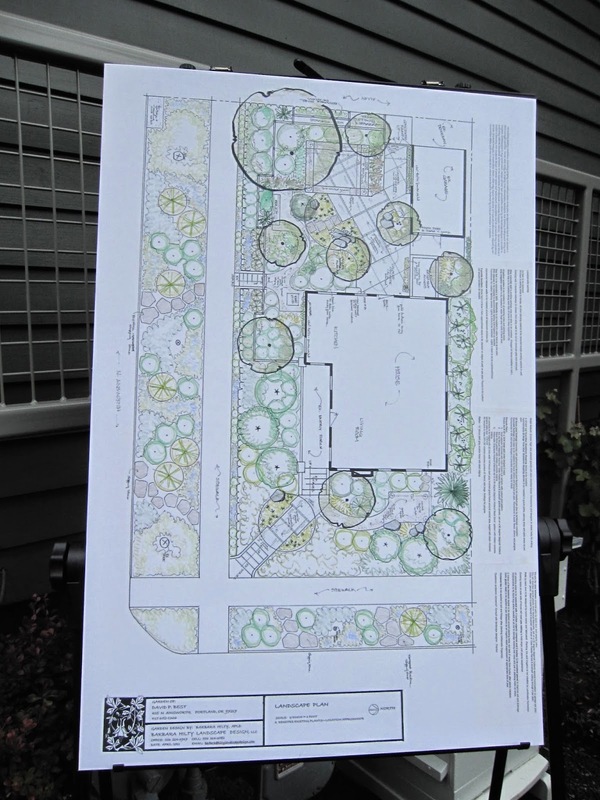 Some interesting design and use issues were solved in the Meihoff Garden, among which were on-site water handling, adding a single parking space, bike access, and low-maintenance plantings. Even the family dog was accommodated by including a Mondo Grass lawn. A deck off the back of the craftsman house flowed down into the back garden and a shady seating area with a fire pit. Very simple plantings, like this Lingustrum, brought the high canopy down to eye level. The simple, raised fire pit was beautifully accented with an irregular rock. The Williams Garden, the last on our pre-tour, was another intimate space where every inch was carefully used. The homeowner commented that with the addition of the covered patio and fire pit, they now use the garden almost year-round. 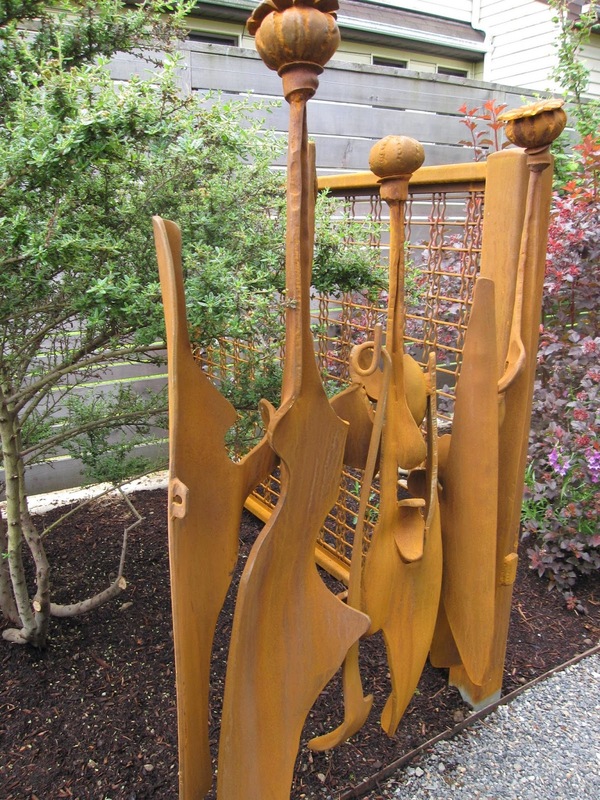 The art added to this garden was restrained; this piece was beautifully set off by the plain cedar fence. A dining table and chairs took advantage of a sunny spot. 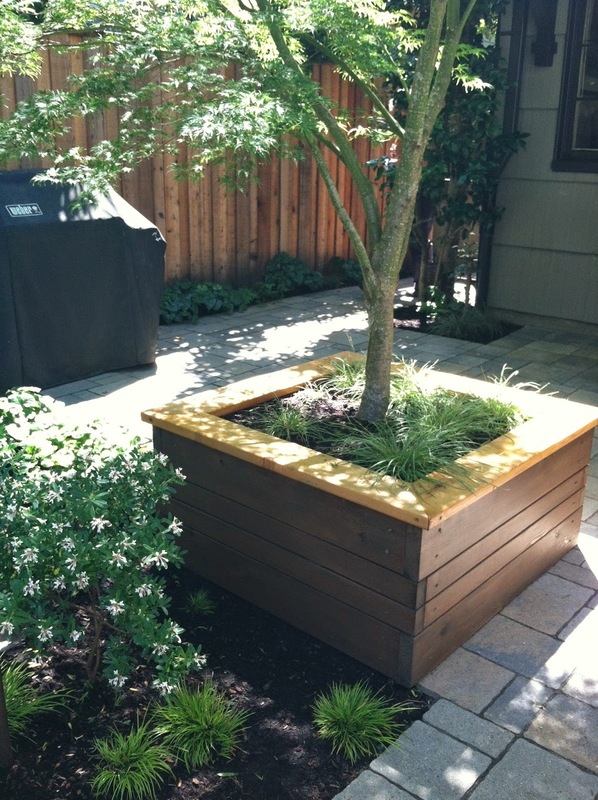 The designer included several large specimen trees to add a note of maturity to this garden. A view of the pathway (and many legs of our group as we heard from the designer!) through a garden bed to the back door. Besides seeing inspiring gardens, the ANLD tour is a great chance to experience for yourself some of the benefits of enlisting a professional garden designer to make the most of your outdoor space. Tickets for the tour are available at Portland Nursery, Cornell Farms, Dennis' Seven Dees, Garden Fever!, and Xera Plants. And proceeds benefit the ANLD scholarship fund - win-win!